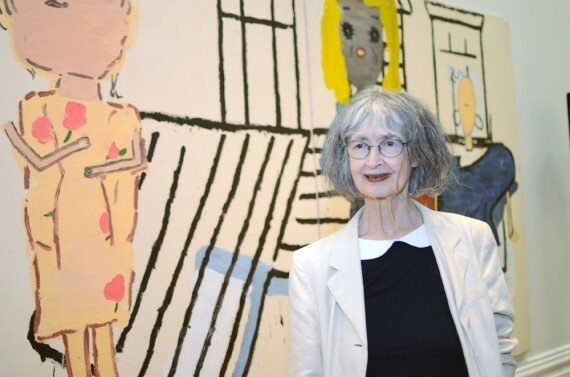 The winner of this year's John Moores Painting Prize is Rose Wylie for her painting PV Windows and Floorboards. The 29th winner of the John Moores Painting Prize is Rose Wylie for her painting, PV Windows and Floorboards. The work depicts four oddly proportioned, disjointed female figures in a windowed space. Selected from over 2500 entries, Wylie was presented with the £25,000 prize during an awards ceremony at the Walker Gallery, Liverpool, where the John Moores exhibition is showing. At 80-years-old, Wylie is nearly twice the average age of previous winners of the prize, which have included David Hockney (1967), Mary Martin (1969), Bruce McLean (1985) and Peter Doig (1993). National Museums Liverpool Director of Art Galleries, Sandra Penketh, said: “PV Windows and Floorboards is a striking painting and a worthy winner of the John Moores. Rose’s work instantly demanded attention when it entered the judging room and it was clear from the start it would be one of the highlights of this year’s exhibition. The four shortlisted artists also receive £2500 each. They are: Rae Hicks for Sometimes I Forget That You’re Gone; Juliette Losq for Vinculum; Mandy Payne for Brutal; and Alessandro Raho for Jessica. This year’s judges were Tim Marlow, director of Artistic Programmes at the Royal Academy and artists Lynette Yiadom-Boakye, Zeng Fanzhi, Chantal Joffe and Tom Benson.